Another great DIY idea. 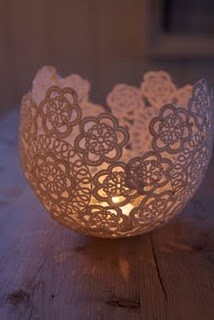 This simple project is made by soaking cloth doilies in sugar starch and then forming it around a balloon. Once the starch dries, pop the balloon and you have a romantic tea light holder. Perfect for a romantic evening at home!